Cohasset, Massachusetts is a lovely New England beach community. You'll find plenty of quaint shops and restaurants downtown, beautiful beaches, and a protected harbor. 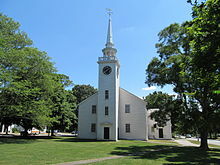 Popular in the summer months, Cohasset has lots to offer residents year round. From the weekly Farmers Market to the Wompatuck State Park, there's always something for residents to enjoy. Welcome to Kingsview! Elegant landmark estate on two acres of rolling lawn with breathtaking ocean and Little Harbor views! HGTV Winner and former Kennedy estate,this stunning home features turn of the century details that blend seamlessly with high end renovations.Recently updated kitchen,island seating,and breakfast nook. Glass conservatory/radiant heat, five gas fireplaces throughout the house for cozy New England nights.Imagine yourself entertaining and hosting parties in the exquisite dining room, family room and living room! Luxurious Master Suite/ balcony overlooking the Atlantic.Sweeping wraparound porches / water views that provide a backdrop for easy living.Stroll through the gardens which are featured in The American Home Gardens Program at the Smithsonian! Fabulous pool house with kitchen and dining area! Relax poolside and grill on the outdoor barbecue. Swim, fish, and kayak on the run connecting Little Harbor to the Atlantic Ocean! Resort style in a dream location! First time offered to market, and a once-in-a-lifetime opportunity to own an oceanfront home on the mouth of Little Harbor. One of the most coveted oceanfront locations in Cohasset, this is your chance to create a spectacular waterfront property and enjoy the remarkable fishing, boating and natural splendor offered by this unique location. With 1.75 acres on water's edge, the opportunities are endless. Build your dream home with spectacular views, sunsets, and a private beach. This property is set amongst multi-million-dollar oceanfront estates and is truly a one-of-a-kind oceanfront setting, with an elevated plot overlooking both Little Harbor and Massachusetts Bay. The ever-changing tide and colors of the sea and sky create a magnificent natural backdrop for your day-to-day living. Located near Cohasset Common, the Village, shops, schools, and the boat & train to Boston. Direct oceanfront living at its best! This home is above the flood zone and protected by a rugged, Maine-like coastline. Built to completion in 2018, it has a modern open floor plan with elevator access to all three floors and offers dramatic panoramic ocean views from nearly every room. In close proximity to Sandy Beach, this well crafted home features hardwood flooring, high ceilings, beautifully detailed trim molding, 2 gas fireplaces and 2 separate 2-Car garages. Each bedroom is a suite unto itself including the master with his and hers private bathrooms. Additional features include a state of the art kitchen with high-end appliances, a second floor laundry center, a walk-out lower level with access to a 20 foot swim spa to help stay fit, and an entertainment sized deck to take in ever changing ocean views. On town sewer, this fine property is ideal for those looking for a moderately sized waterfront property with the possibility of expansion in the future if needed. Outstanding! Perched atop one of Cohasset's signature granite rock outcroppings, this home has water views from almost every window, with prime vistas of Massachusetts Bay and Minot Light. This custom designed home boasts ten and twelve-foot high ceilings with wall to ceiling windows. Directly on the Greenbush train line, and 15 minutes to the Hingham Ferry. Gracious living can be had among family and friends in the large open floor plan with an epicurean kitchen. The master bedroom includes a sitting area, fireplace, large jacuzzi tub, spacious walk-in closet and ones own private deck with 180 unobstructed ocean views. Perfect for inspiring sunrises, as is the 1000 sq ft exceptional rooftop deck. Radiant heated flooring runs throughout the bedrooms, baths and in the high ceiling 3 car garage. The lower level offers a workout room and a 3-tiered media room w/10' drop-down screen. A quaint pool and patio for summer gatherings. A must see for anyone dreaming of a beautiful water view home!